Not to be confused with Ouida. Ouidah (/ˈwiːdə/) or Whydah (/ˈhwɪdə, -ɔː/; Yoruba: Xwéda; Ouidah, Juida, and Juda by the French; Ajudá by the Portuguese; and Fida by the Dutch), formerly the Kingdom of Whydah, is a city on the coast of the Republic of Benin. The commune covers an area of 364 km2 (141 sq mi) and as of 2002 had a population of 76,555 people. In local tradition Kpase is supposed to have founded the town. This probably happened towards the end of the sixteenth century. The town was originally known as Glēxwé, literally 'Farmhouse', and was part of the Kingdom of Whydah. Ouidah saw its role in international trade rise when the British built a fort here in 1650. Whydah troops pushed their way into the African interior, capturing millions of people through tribal wars, and selling them to the Europeans and Arabs. By 1716, when the massive English slave ship Whydah Gally arrived to purchase 500 slaves from King Haffon to sell in Jamaica, the Kingdom of Whydah had become the second largest slave port in the Triangular trade. "WHYDAH IN AFRICA: the beginning of this month, Agaja the king of Dahomey came down unexpectedly with an army, and soon became master of this place, and the country adjacent Allada; the defoliation which ensued was so great, that it is impossible to be represented! The factory at Saber, once the king's town and Seat of Trade, was burnt to the ground, and in it a great quantity of merchandise. Forty Europeans were carried into captivity, to the King of Dahomey's camp at Ardrah, but after having been detained about 14 days, seven of them were released and are now returning hither; they gave a melancholy account of their treatment. This country, which was the pleasantest in all these parts, is now laid waste by fire and sword, and made a wilderness!" The land which constituted the Kingdom of Whydah became a mere city in the new Kingdom of Dahomey. The Portuguese, English, Dutch and French all constructed forts in the city to protect their interests in slaving. The Portuguese had reached the town which they called Ajudá in 1580 and the Portuguese Fort of São João Baptista de Ajudá, now housing The Whydah [Ouidah] Museum, dates from 1721 and remained with Portugal until 31 July 1961. In the time frame of 1946-1949 French government estimates put the population of Ouidah at about 14,600. By then it had a railway. It was a center for production and trade in palm kernels, palm oil, copra, coffee, manioc, beans, tomatoes and onions. It was also a venter of the fish trade and the manufacture of vegetable oil. It had Catholic, Protestant and Muslim places of worship. The Fort of São João Baptista de Ajudá (in English Fort of St John the Baptist of Ouidah) is a small fortress built by the Portuguese in Ouidah on the coast of Dahomey (originally Ajudá, from Hweda, on the Atlantic coast of modern Benin), reached by the Portuguese in 1580, after which it grew around the slave trade, for which the Slave Coast was already renowned. In 1680 the Portuguese governor of São Tomé and Príncipe was authorized to erect a fort. In 1721, after having been abandoned for some years, it was reconstructed and named São João Baptista de Ajudá. The Fort, built on land given to Portugal by King Haffon of Whydah, remained under Portuguese control from 1721 until 1961. The fort had an important impact in Benin, greatly contributing to both the Portuguese and African slave trade. Its importance is attested by the fact that the Portuguese language was the only foreign language that the Kings of Dahomey authorised. Portuguese descendants were also important in the political structure of the kingdom and some established Portuguese-Brazilian families, such as the de Sousa / de Souza whose descendants still exist in Benin, Togo and Ghana, were powerful and abided by private law. 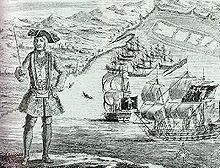 In January 1722 the pirate Bartholomew Roberts ("Black Bart") sailed into the harbour and captured all the eleven ships at anchor there. Following the abolition of the legal slave trade in 1807, the fort, which had before been one of the major slave ports, gradually lost its importance and although Portugal continued to claim it as one of its possessions, formal occupation and administration were abandoned on several occasions. It was only when French presence in the region started threatening Portugal's interests that the settlement was again permanently manned. This didn't prevent the French conquest of Dahomey (1891–1894). After this, São João Baptista de Ajudá – now reduced to the territory actually within the walls of the fort – lost what remained of its importance. The fort was reoccupied by Portugal in 1865. In this period it served as a base for a brief Portuguese attempt to create a protectorate in the Kingdom of Dahomey of which the city of Hweda (Ajudá – Ouidah) was part (1885–1887). 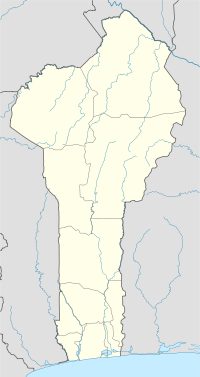 Until its annexation by Dahomey in 1961, São João Baptista de Ajudá was probably the smallest recognized separate modern political unit, initially around 1 km2 (0.4 sq mi) and later reduced to only 2ha (5 acres), at which time, according to the census of 1921, it had 5 inhabitants and, at the moment of the ultimatum by the Dahomey Government, it had only 2 inhabitants representing Portuguese sovereignty, who tried to burn it rather than surrendering it. When the fort was captured, they were hastily escorted to the Nigerian border and expelled from the country. Only in 1975, after the Portuguese Estado Novo regime had been overthrown due to the Carnation Revolution at Lisbon, did the annexation of the fort by Dahomey (now renamed Benin) gain official Portuguese recognition. This was followed by the fort's restoration, which was paid for by Portugal. The fort is a small square with towers at the four corners. It comprises a church and officers' quarters. The Fort of São João Baptista de Ajudá now houses a museum. Bruce Chatwin’s book The Viceroy of Ouidah (1980) is a fictional retelling of the life of Francisco Félix de Sousa, the Sousa family founder in Benin, and of his powerful local descendants, dealing also with the slave trade with Brazil. The novel inspired Werner Herzog’s movie Cobra Verde (1987). Other attractions in Ouidah include a restored mansion of Brazilian slavers the Maison du Brésil art gallery, a voodoo python temple, an early twentieth century basilica and the Sacred Forest of Kpasse, dotted with bronze statues. The Route des Esclaves, by which slaves were taken to the beach, has numerous statues and monuments, including the Door of No Return, a memorial arch. The Market Center of Ouidah, which was established by Scouts more than 20 years ago, trains young people in agricultural skills, thus helping to reverse the exodus towards the cities. 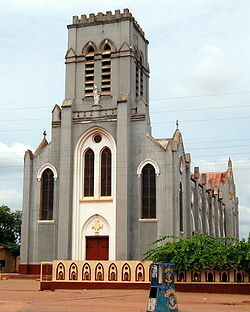 Ouidah is the spiritual capital of the Vodun religion, and hosts an annual international Vodun conference. This site was added to the UNESCO World Heritage Tentative List on 31 October 1996 in the Cultural category. ^ "World Gazetteer". Archived from the original on 11 January 2013. ^ Kein, Sybil, Creole, p227. ^ "Communes of Benin". Statoids. Archived from the original on 30 April 2012. Retrieved 5 January 2010. ^ Ouidah Museum, Benin - "Depart pour D'Autres 'Ceux', Convoi De negres: homes, femmes et enfants, conduits enchaines par des metis Arabes"
^ United Press International (2 August 1961), "Dahomey Takes Over Enclave And Expels Portuguese Official; Lisbon Aide Burns Residence – African Nation Raises Flag Over Ajuda." (PDF), The New York Times, The New York Times Company, p. 13, retrieved 13 December 2008 . ^ "Benin". World Gazetteer. Retrieved 19 December 2008. ^ "The Voodoo Day: Benin welcomes magicians from all over the world". 1 November 2004. Retrieved 29 August 2008. Wikisource has the text of the 1905 New International Encyclopedia article Whydah.